As a writing tutor, I have to say this is one of my all time favorite LOLCats. This definitely captures the thoughts that occasionally cross my mind when working with the more, shall we say, "challenging" clients--except this is actually probably nicer than some of the thoughts I occasionally have during really bad sessions. Anyway (don't you dare call me distractable--it's merely, um, mental multi-tasking. Yeah. That's it), Roseworks has two cool etsy shops (RoseworksJewelry and kstreasures) plus a blog where she's been running a really useful series on all the different online venues where one can sell their handmade stuff--if you haven't visited that already and you're a craftisan, I strongly suggest checking it out. Who can resist a fat black cat? This is my (as of now) newest design--and one of the ones that Robin will be turning into a cool screenprint on t-shirts and napkins and other fun stuff. 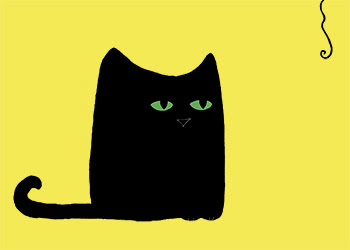 In the meantime, however, it's also available as a print or magnet in my etsy shop--if you don't see it right away you can click on any print or magnet that is the size you want, order it, and just note that you want the fat black cat as your design in the "notes to seller. Or you can find it on a whole bunch of goodies with your own customizable color background in my zazzle shop! (EDIT NOTE: This post was edited to remove the PayPal buy direct button on 3/30/10 because I get notices more consistently from Etsy when a purchase is made an an issue came up when someone tried to buy direct via PayPal. Until I get that issue sorted I'm keeping everything going through Etsy for my handmade stuff). I'm giveaway obsessed (as you might have already guessed, seeing as I founded EtsyGiveaways and all), and periodically I like to share my latest fave--and this one definitely counts. Talk about funkalishous Valentine's fun--I sooo want to win this one! So I'm blogging about it to share the wonderfulness, but if you go and enter and win you'll give it to me, right? ;) It ends soon though, so you'll want to scoot over there quickly. Normally I struggle coming up with something to blog about, but tonight I actually had to choose between a few things (a video of my parrot waving my crochet hook around like a light saber, an image of a new design I've been working on, and the screenprinting related post that follows). Fortunately, my inherent laziness...err, efficiency won out (the first two would have required posting videos and images online that weren't already there, and this use of time was deemed inefficient by my late-night sleepy-head self) and ultimately made my decision process easier than anticipated. Anyway, my happy happy happy dance (and yes, it is 3 happies--that's unsual for me, so take note, any would-be biographers of my ever-scintilating life) is about my having found the extremely wonderful local etsian Robin, who is a screenprinter (among other things). I've been wanting to screenprint my own apparel, pillow cases, etc. for a while now (I far prefer supporting another etsian to supporting cafepress and zazzle) and my crafty dreams have now been answered--yippee! Keep an eye out for pictures soon of the screenprints we're collaborating on. In the meantime, I'm including an example of one of her current screenprinted items from her etsy shop, FacesAreFunny. 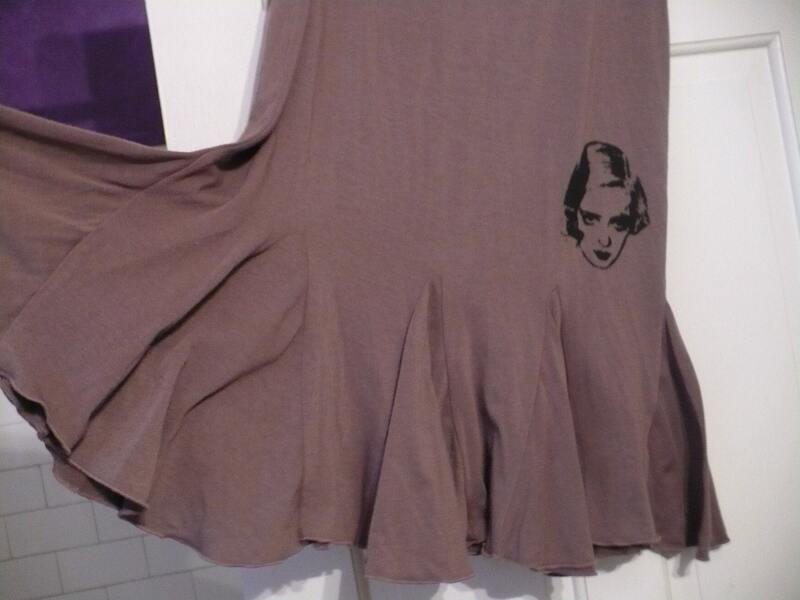 I wish I was a small so I could fit into this bette davis skirt (she uses thrift store items to be more eco friendly, which I love--unfortunately it means cool items aren't always there in my size). Okay, yes, so this is an obvious set-up for my new so-adorable-they'll-change-your-life [insert eye roll here] "Not just puppy love" card + magnet set that I conveniently made just in time for Valentine’s Day, but still: roses, Hallmark poems, and "every kiss begins with K, now-I'm-wearing-the-same-thing-as-half the-housewives-in-America" pendants all scream (to me at least) either uninspired puppy love or panicky significant others who know they're supposed to do something, right? Or else they're in trouble. I don't hate V-Day anymore, because of my new self-imposed decision to take it back from the same-old sap—or make it some fun sap, at least. I, as you may have guessed by now, made this magnet for my husband for V-Day with ironical sap in mind. I think it would be fun if people got just a little funky for V-Day, whether it's by making, doing, or buying something unusual [hint, hint to the hubster--though he's been on a roll lately, so he may not need one (grin)]. To ArtFire or not to ArtFire? 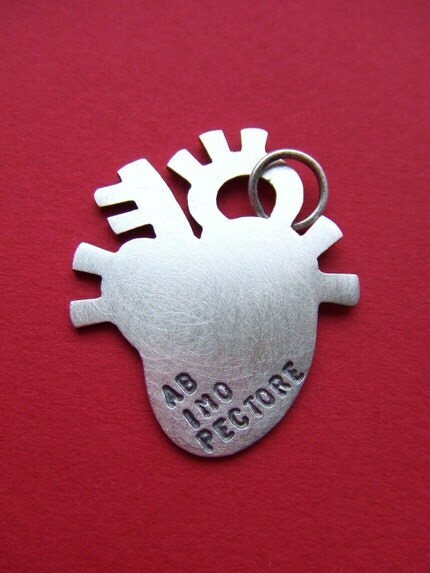 Do you seem to get as many (or more) views on new listings at ArtFire as you do on etsy? Is the front page on ArtFire just listed items, or specially selected ones? Does AF's search function seem to be any better than Etsy's? Does AF's buying process seem to be less confusing for new buyer's than Etsy's is? Generally how have you found the two sites to compare? Thanks in advance for the help--oh, and as an extra thank you for the assistance, I'll pick one of my advice givers randomly to sign up under if I decide to make the switch, so if you have some kind of referral code feel free to leave it in your comment. Does this mean I'm a twit? I gave in. I tried to resist the Twittering craze, initially, but found my resistance slowly eroded after hearing etsian after etsian rave about how much they loved it. Of course, my initial resistance was not entirely principled--unless you count "fear of another time sink addiction" as a principle, that is. But I could--and did, to some family members--make very highfalutin arguments against Twitter, revolving around the rapid disappearance of private life, our willingness to facilitate that, and blah blah blah. So now I'm wondering--how many of you Twitter, and enjoy reading Tweets? What kind of tweets would you like to see from me? You can check out my twitter page here. Catnip flashback(s): Which, if any, do you like? 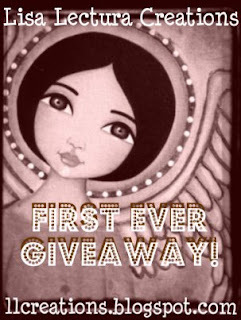 I just found Lisa Lectura's blog today, and a giveaway she has going on until the 11th to celebrate her 100th blog post. 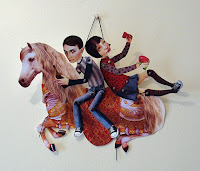 I really like her art dolls and prints; they're tres quirky and fanciful. I'm referring to the idea up for vote at change.org (a very cool site, incidentally) on forgiving student loans. The short version: please please pretty please with a catnip mouse on top consider taking a moment to vote for this idea. The top ten ideas from change.org will be presented to Obama's administration on January 16th, and I'm really hoping both this one and the CPSIA one that I blogged about several posts ago will make the cut. The long version, for those who are bored, or curious, includes my reasons for supporting this idea below (but since I can't help but chat on about this one in depth, I thought I'd put the most important thing--the voting--up front). My husband and I have a huge amount of loan debt--I won't name specific numbers because it would probably bother him if I did--but most of it comes from his undergrad, when he was forced to take out a lot of loans to get his BA because his financial status was being judged based on his father's income--which was fairly high at the time--and thus he couldn't qualify for need-based funding. The problem was that his father wasn't actually paying for any of my husband's schooling, and the college he was attending was too small to have much in the way of student work programs (those it did have were reserved for those who had been judged to merit need-based aid) and too difficult, academically, to manage working and taking classes at the same time (the school only allowed full time enrollment). Once he graduated, he became a journalist--a job he was perfectly designed for, but which unfortunately didn't pay very much (newspaper reporters never made much, even before the decline of the industry), so though he was paying his loans back he was doing so at a fairly slow rate. Then the newspaper industry started failing (it's only hitting public consciousness now, but it began around 2003) and he was laid off. He applied for newspaper jobs all over the place but could find none, and he'd been doing it for 5 years and the job skills didn't exactly translate into another career. Since then, he's taken more part time jobs than I can name without boring everyone with the length of the list, but has had no luck in securing lasting full time employment despite trying very hard to find it. In the meantime, I've been in school, getting first my MA and now my PhD; I've been getting funding, but not enough not to need to take out a few loans of my own. Consequently, our monthly income is such that we qualify to make much smaller than normal payments on his student loans, which is very nice--except those payments are entirely interest, without any principal. Thus for most of the last 4 years we've been scraping by and paying what we can while never actually decreasing our debt owed. This seems incredibly messed up to me. Yes, I understand that one's word is one's bond, and that if you agree to something you are responsible for fulfilling your agreement. At the same time, if you are found to be making a strong effort to uphold your end of the bargain and are unable to because of circumstances outside your realm of control (i.e. the economic mess we're all in currently), it seems morally offensive to me that the contract wouldn't be renegotiated in a way that is fair and reasonable for everyone. It's not that I think my husband and I should be let off scott-free from our debts (though that would certainly be nice, I won't lie), but that I think it does no-one any good--the government, the loan companies, nor those in debt--to be trapped in a fairly unbreakable cycle of perpetual payment without actual debt reduction. One of the elements of the idea up for vote at change.org is the idea of forgiving the interest on student loans, and that seems reasonable to me, especially given all the loans that are being covered by the fed for various banks, etc. Yes, there is such a thing as living by a set of principles--but practicality has to factor into life as well (as we all know all too well, I'm sure), and practically speaking forcing individuals to uphold their debt responsibilities while forgiving large corporations of theirs doesn't seem like a solution, since it will require individual consumer confidence to get us out of this mess, and that confidence is pretty hard to attain when under a mountain of debt with no clear way through it. Of course, I'm not an economist, so perhaps I'm getting this wrong. I certainly welcome discussion of the idea, regardless of whether you agree or disagree. In the meantime, I'll get off my soapbox. I usually try to avoid titles as dull as that one, but I think my creativity level for the day got sucked up by my drawing and didn't leave anything behind for clever word play. So it will just have to be sincere Becca tonight--what a drag, I know . So I finally decided to use my new wacom tablet (thank you again, Santa/hubby) to create a piece of art, and I'm pretty happy with the results. Recently I've been sketching a lot of folk-ish primitive-y style cats, in a very different style than my prvious stuff, but I'd yet to transfer any of them to the computer and make a complete piece (my usual approach is to do the preliminary drawing with pen and paper, scan my original, and digitally colorize the piece). Tonight I skipped the scanning stage and just went for straight drawing into Photoshop via my tablet. I was particularly into the idea of using something so modern to create something that looked very rough and primitive--what do you all think? So far I don't know how to use all the bells and whistles on my tablet, but I'm loving the ones I've figured out so far--like how the pressure sensitive tip will vary the width of my lines and how I can flip the pen around and use the "eraser" on the reverse tip if I draw something I don't like. p.s.--I only have this listed as an 8x10 currently--but if you'd like a print version of this as a 5x7 or art card let me know; I'm happy to make it for you. p.p.s.--Since a few people have asked: yes, a wacom tablet is a device with a digital pen and pad through which i can draw or write directly into programs like Photoshop. The hubster had a hard time picking the winner from the submissions sent in by my newsletter subscribers for the Nov./Dec. contest. This time, besides just the typical difficulty of him hating to choose amongst cute kitties (during which time he mumbles and grumbles about not knowing how he could have possibly been foolish enough to volunteer to be my "objective" judge for the photos that were sent in), he also had to contend with each of the kitties vying for a different choice. Allie Mae, of course, was pushing for this one of Luxor all snuggled up in a blanket, since she has a super-big and not-so-secret crush on him. Snacker, meanwhile, thought that Miz Allie Cat looked adorable in her Santa hat--and like a potentially nice replacement for Allie Mae (who has been annoying him lately), pointing out to me that I wouldn't even really have to learn a new name or anything. 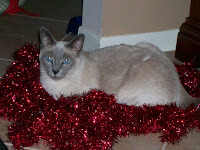 He was undeterred by my suggestion that PBDesigns might not want to give up such a lovely kitty in the first place. 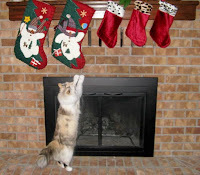 Then Puma chimed in to say he was very impressed with Angel's (of BeadedTail fame) stocking-snagging skills, hoping that if her photo won she might be willing to give him some free lessons. However, Zorro was equally impressed with the seating selection made by QuirkyDolls's kitty, and asked me to please procure some tinsel so he could add it to his unusual perches repertoire. He also got into a slightly heated argument with Puma about why the ability to choose the perfect spot to sit was superior to the ability to stand on two paws, accusing Puma of acting far too "human-y" for a "proper" feline (Zorro has very definite notions about these things). Still, despite all 16 kitty paws trouncing across my DH's hands as he tried to make his selection, he was finally able to decide. So.... (kitty paw drumroll please) Congratulations, Luxor--you've won a $20 gift certificate to the PurrPrints etsy store. Just contact me about what you'd like to get with it and I'll let you know what to do from there. 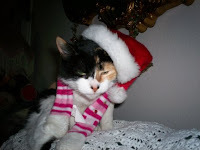 They'll be another cat photo contest starting shortly for my newsletter subscribers, so if anyone new would like to participate just subscribe to the newsletter and you'll get the necessary info in the next couple days. Thanks for sending in such wonderful, sweet, wintry photos! A friend of mine from school who also runs a crafting shop could use a little help with her thesis--she's writing about people's impressions of fairy tale princesses. If you have a few spare moments, will you help her out by answering her questionnaire? Oh, and in case you haven't been inundated enough with well wishes, Happy New Year!